BRISTOL -- The clock struck midnight on Cinderella in the Class LL baseball tournament. With an FCIAC title in hand and a berth in the state baseball final in sight, No. 15 Warde had its stunning postseason run cut a step short on Tuesday. Third-seeded Southington authored a two-run rally to edge the Mustangs 6-5 in the LL semifinals at Muzzy Field. The Mustangs, who won their first FCIAC championship as a No. 7 seed, ended the season at 18-9. They defeated two higher seeds -- No. 2 Staples in the second round and No. 10 Trumbull, the FCIAC runner-up, in the quarterfinals -- along their run through states. "To say that I thought this group would be FCIAC champions, I think, would be a stretch," coach Mark Caron said. "But it just speaks to the character of these kids and how badly they wanted it." 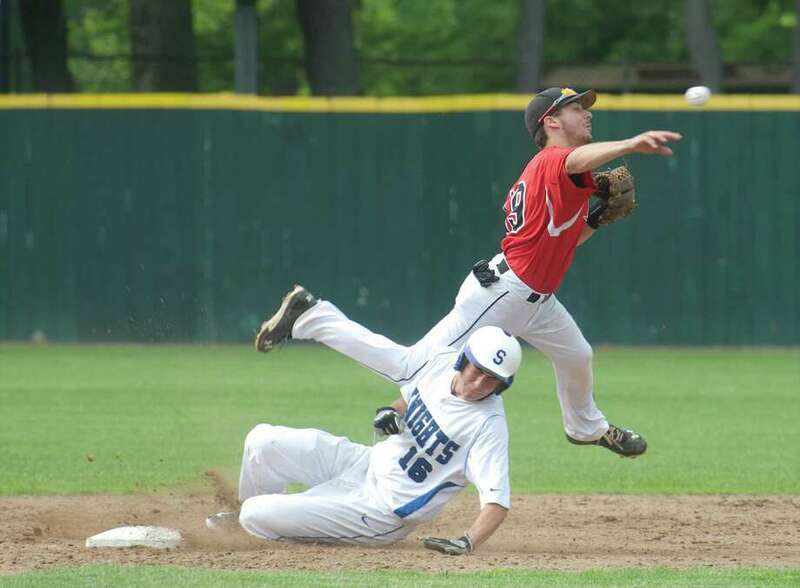 Southington (18-3) will make its second straight trip to the LL final and the third in four years. It lost in the final to Amity last year and to Newington in 2011. Trailing 4-3 in the fifth, the Blue Knights capitalized on reliever Nick Nardone's wildness. They loaded the bases with one out on walks, then tied it on Brett Shaw's single. Another walk to Drew Farkas -- the fourth of the inning and sixth of the day between two pitchers -- gave the Blue Knights a 5-4 lead. "Sometimes he struggles in his first inning and then gets a lot stronger," Caron said of Nardone, who replaced starter Hunter Hewitt to start the fifth. "I don't know if he was dealing with the mound. It looks like he was having some footing issues." Warde nearly rallied in its final at-bat off Southington's Farkas, who retired 10 straight in relief entering the seventh. Giacomo Brancato tripled home a run with two outs, but Christian Sabella struck out to end it. "He really gutted it out there," Southington coach Charles Lembo said of Farkas, a lefty sophomore. "This was probably the biggest situation he's ever been in in his life on the mound." Farkas' day began much earlier than expected after starter Joe Rivera uncharacteristically struggled with his control. Despite entering with only 19 walks in his previous 54 innings, the right-hander issued seven walks over 2 ï»¿2/3 frames on Tuesday. Warde plated two runs on bases-loaded walks during a three-run third for a 4-1 lead. "(Rivera) had trouble with his grip because he was sweating so much," Lembo said. "We couldn't find a towel until it was too late." Control problems also cost the Blue Knights in the first inning, during which Warde scored without a hit. Tom Luckner came around to score on a wild pitch after drawing a leadoff walk. The Mustangs' patient approach paid off, at least until Farkas came in. "We wanted to watch him make his first pitches," said Warde's Dakota DeJardy, who drove in a run with a walk. Southington sliced into the lead in the third, plating a run on Ryan DeAngelo's double off the right-field fence. DeAngelo also doubled home a run in the sixth to make it 6-4. Warde nearly rallied, but it ran out of surprises. "I thought we were going to come back," DeJardy said. "I thought we were going to do it again." Records: Warde 18-9; Southington 18-3. Batteries: W--Hunter Hewitt, Nick Nardone (5, L) and Anthony Miller; S--Joe Rivera, Drew Farkas (3, W) and Zach Susi. Highlights: W--Giacomo Brancato tripled and singled in runs; Dakota DeJardy and Zach Weinstein each drew RBI walks. S--Ryan DeAngelo doubled twice and had two RBIs; Farkas and Brett Shaw each singled in a run.